Could Blockchain Technology Improve Water, Wastewater, and Solid Waste Management in the Oil and Gas Industry? Water and wastewater management in the oil and gas industry is a very complex and challenging issue due to the high volumes of water required, the hazardous nature of the waste water, and the multitude of transactions of both clean and waste water that need to be monitored. 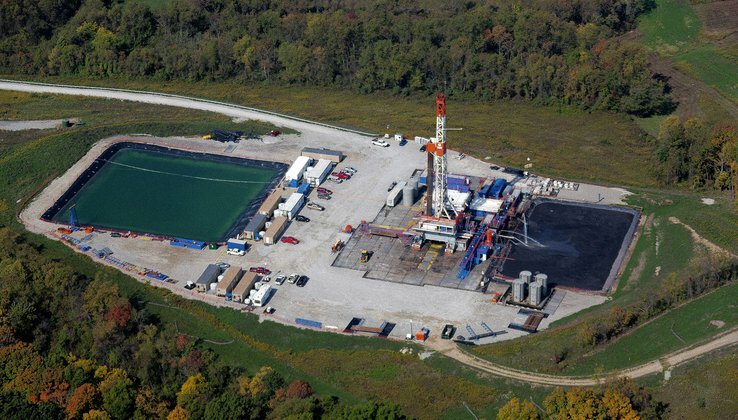 Each well using hydraulic fracturing technology requires millions of gallons of water and generates millions of gallons of flowback and produced wastewater for treatment, recycling and reuse, and disposal over its development and production life cycle. Finding sufficient high-quality source water nearby the wells and managing wastewater treatment and disposal are two major challenges to the industry. Due to the chemical characteristics (high concentration of dissolved solids, heavy metals, and radioactive materials) and large quantity of the wastewater, improper management could have significant impacts on human health and the environment. In addition to water and wastewater, unconventional oil and gas development also generates solid waste, such as drilling mud and drill cuttings, which also require proper disposal. Blockchain technology, a database management platform, could be useful for improving the reporting and efficiency of managing large databases of transaction information, which in turn can be used to develop optimal management strategies and to reduce health and environmental impacts. For oil and gas development operators, getting information about available source water and options for waste management and disposal is critical and time-consuming at the initial planning, well development, and oil and gas production stages. Blockchain technology could provide a means for efficient, accurate, and transparent collection of this information, enabling operators to avoid errors in reporting and develop better waste management strategies that limit opportunities for leakage or illegal dumping. For regulatory agencies, keeping track of the flows of the waste streams is necessary for public safety, but record keeping and verification require substantial effort. These records include source water transactions (location of source and quantity purchased), wastewater generation, shipments of wastewater, treatment of wastewater, supply of reclaimed water, wastewater disposal quantities, and quantities and pollutant concentrations of material sent to a landfill for disposal. Blockchain technology uses a distributed ledger (shared and synchronized digital data) to record transactions between two parties efficiently and in a verifiable and permanent way, without requiring a central entity to record and maintain the list of transactions. For use as a distributed ledger, a blockchain is typically managed by a peer-to-peer network collectively adhering to a protocol for inter-node communication and validation of new blocks, which are collections of transactions. In the water and wastewater context, conceptually, the system of water flow is a network. Each node of the system is an individual actor in the water network. For example, the well developer ships wastewater from the well pad to wastewater treatment plant. The well pad and wastewater plant are two nodes of the water network and tracking of transactions between them is important for preventing illegal dumping. Using blockchain technology to track these transactions will facilitate accurate assessment of quantity transactions, checking for violations of the maintenance of water mass balance, and enhance the identification of potential leaks. Once recorded, the data in any given block cannot be altered retroactively without alteration of all subsequent blocks, which requires a consensus of the majority of the network, directly facilitating transparency for the transaction process and accurate and efficient management of data. While oil and gas well operators and regulators are already collecting much of the information blockchain technology would record, implementing this tool could improve that process and the resulting database of transactions. Both the water and wastewater systems are decentralized networks, which has made consistent database development and management difficult despite costly efforts by operators and regulators to collect and maintain the necessary data on flows between participants in the network. Regulation and economic incentives will likely need to play a role in ensuring accurate information entry at the point of generation, such as initial waste water output from the well. But, the implementation of this technology could save taxpayers’ money, reducing the need for costly audits and improving incentives for accurate reporting of downstream transactions. By itself, blockchain is not sufficient to ensure optimal transactions. However, it could provide better quality data inputs for making such decisions. Furthermore, it could help to establish a platform for a reclaimed water market. Blockchain also could improve the recycling efficiency and lessen regulatory efforts and might help to make shale gas development more sustainable. We thank Daniel Raimi for valuable comments and Alan Krupnick, Kristen Hayes and Ray Kopp for their encouragement.